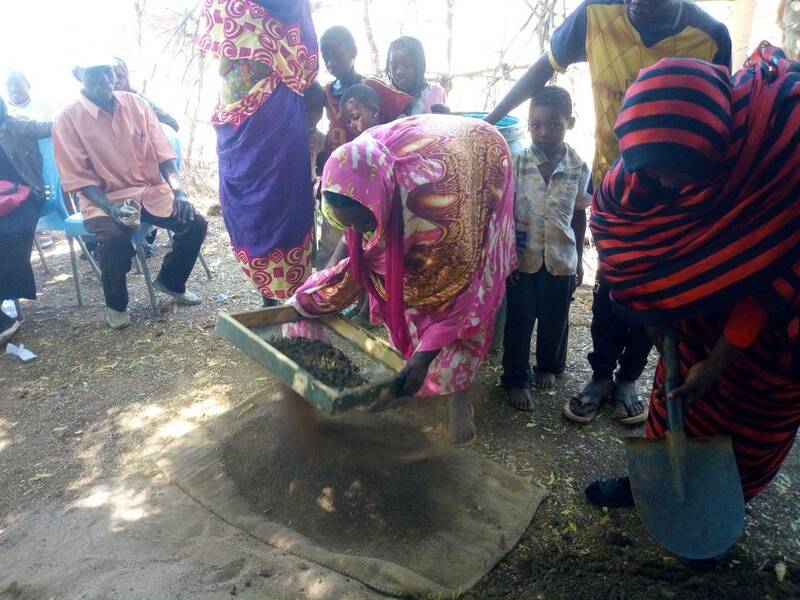 In a village called Abu Jebeiha, NEF is training community members in how to use their new brick making machine. 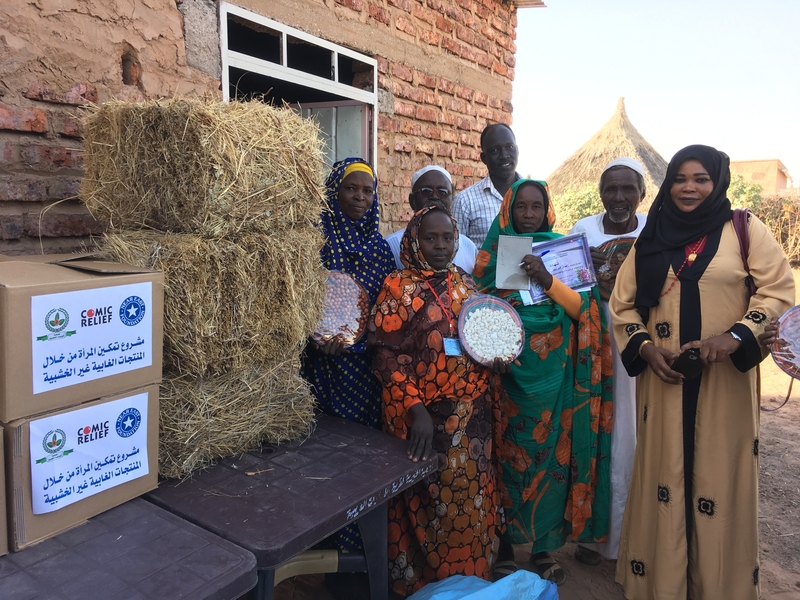 The machine was provided through NEF UK’s Empowering women in Kordofan through non-wood forest products for income and food security, funded by Comic Relief. This brick making enterprise is one of 25 natural resource management (NRM) microprojects that form part of a wider effort, providing a sustainable income to communities with limited income generating options, while reducing deforestation and improving forest management practices. In this case the bricks will replace wood as a construction material, reducing the need to cut trees and providing a more durable quality of b­uilding. Other examples of these forest management microprojects include seedling nurseries to increase plant and forest cover in communities where land has been degraded, and providing gas cylinders to reduce the use of firewood. Additional efforts focus particularly on women in poor and remote communities, to increase their incomes and improve management of natural resources by introducing new techniques for producing and harvesting key non-wood forest products such as gum arabic, desert dates, honey, sider, baobab, and other local fruits that improve quality while reducing the degradation of the trees that produce them. The formation and capacity building of local “women’s associations” is the main entry point to the empowerment process that NEF seeks to achieve for women in these communities. The “Women’s associations”, act as a cooperative for producers and others to collaborate on marketing, commercialization, and management of natural resources. While over 5,500 people have directly benefitted from this work so far, the impacts reach far beyond natural resource management improvements and include enormous economic, networking, and psycho-social benefits. With NEF’s help, association members from Al Odiat village have been able to upgrade their non-wood forest products through screening, sorting, adoption of improved storage techniques, new packing techniques, and increased efforts to prevent insect infestations. These enhancements, along with formalized packaging and branding, have resulted in a higher price for their goods. Another goal of the project is to help associations improve linkages with wholesalers, which gives them access to a wider market. The training NEF UK provided on management, communication, leadership, and business coaching has helped the association achieve this. NEF UK is also introducing microfranchising to these communities, facilitating enterprise expansion and creating a brand for these products that will further help them to access local, national and international markets. Fatima is the chairperson of E’diat Shargia women’s association. Before the project, people in the village were unaware of how to maximize their income from non-wood forest products. Due to their perceived lack of value, the harvesting and management of these products was left to women in the community. When NEF’s project team came to her community, Fatima immediately got involved, seeing the potential impact in the work proposed. “I realized that the only economic resource that was exclusively under the control of women in the village was non-wood forest products,” says Fatima, “I thought that if women of my village managed to unite, they would contribute to increase their income and would gain respect from their husbands and other men.” The village has access to nabaq (Sider), gum arabic and laloub (desert date), but was not deriving much income from these products as they were either consuming them or selling the products raw and unprocessed. “I mobilized the women’s association members (men and women) and convinced them to get trained to produce improved products, this was done through peer training and project staff. Today every woman from the association that is involved in improved production says that she derives important revenues from it,” explains Fatima. Beyond the increases in income, she has also seen attitude and behavior changes related to deforestation, with many men planting sider and desert date plants in fields around the village. “This is one of my greatest satisfactions in life!” she says, outlining how she encouraged village members to set up household nurseries and for men to give land to women so they could plant trees too. She now believes that most the men in her village are supporting the association in various ways, and the village chief has said that the future of the community is now in women’s hands. 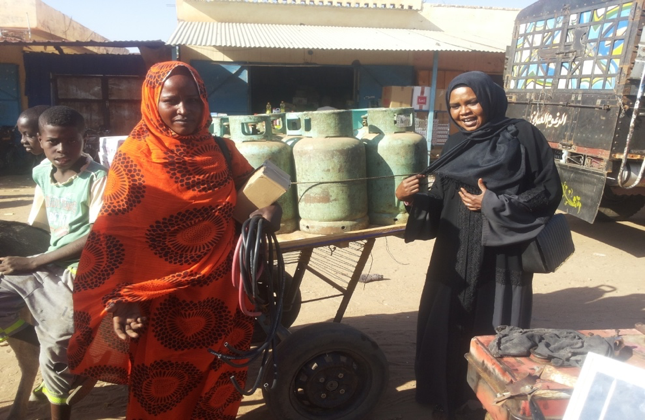 Click here to learn more about NEF’s work in Sudan.